Not many drummers can span everything from the accessible, solid, pop sounds of John Lennon to the mixed time signatures, frenetic tempo variations and dynamic overtures of Yes. 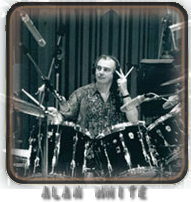 But Alan White s playing has consistently shown his yoga-like, stylistic flexibility while keeping a creative edge, regardless of genre. He played with Lennon on his successful "Imagine" album, with George Harrison on "All Things Must Pass," and has been the driving heartbeat of Yes since 1972. Great grooves in 7/4, 7/8, 5/4 and 9/4. There s even a taste of 4/4 here and there, plus new drumkits for use with DrumCores MIDI sound module/virtual instrument.